I've been abandoned by my family. They headed for the glamour of a volleyball stadium 2 hours from here and left me to fend for myself... at home... all weekend. Do you have any idea how much I love my me-time where I get to do whatever the heck I want? I get to sleep in the middle of the bed (although Mr Milk and Honey would probably tell you that I do that when he's home as well so what's the diff? ), get to watch all those HBO DVDs that I seriously have not shut up about, get to take a long bath without someone wanting me to find their teddy bear or get them a glass of water when I'm in mid-wallow, and the best thing of all, eat whatever I want, whenever I want. Things like a Bloody Mary and half a box of crackers for dinner, and a Chocolate Pot at 7pm and one at 9pm. 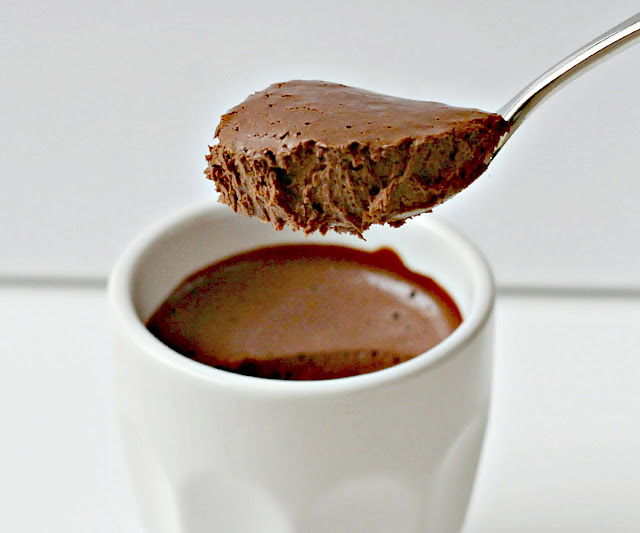 Crush the chocolate to smithereens in a food processor with the blade attachment. 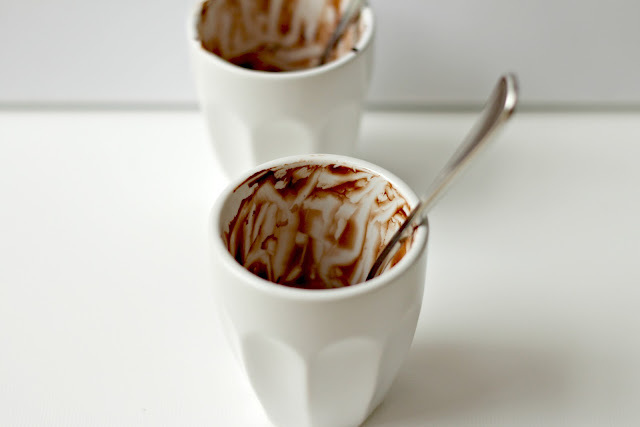 Heat the cream and milk until just about boiling, then add the vanilla and allspice and pour through the funnel over the chocolate. Let stand for 30 seconds. Process for 30 seconds, then crack the egg down the funnel and process for 45 seconds. 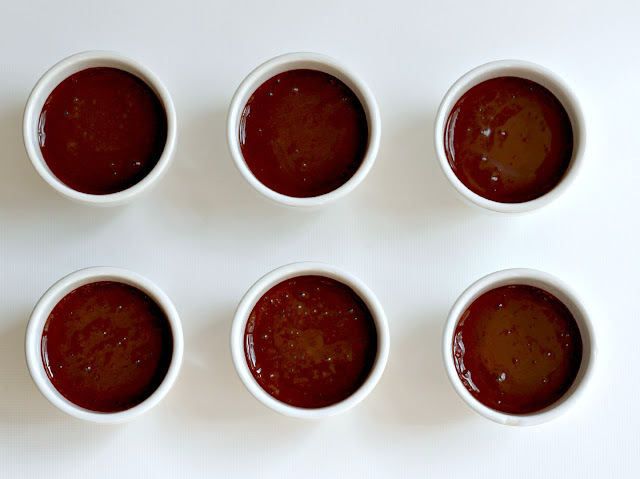 Pour into 6 small coffee cups and sit them in the refrigerator for 5 hours or overnight. But remember to take them out of the refrigerator a good 20 minutes before you want them to be eaten; the chill interferes with their luscious, silky richness. 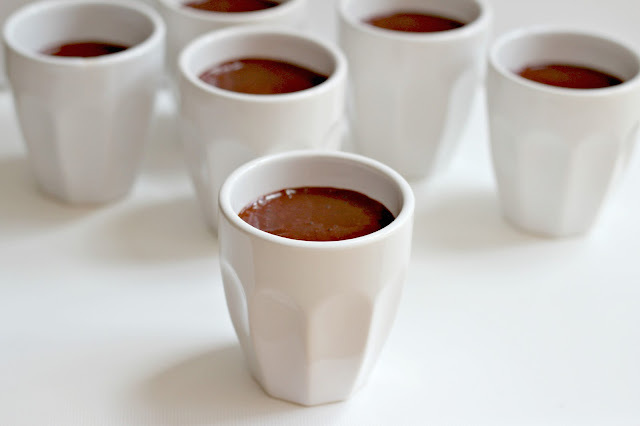 It is that eay to make chocolate pots? How come I pass away from this? +, I always have this exact chocolate. I take it at Petite Italie here and it is my favorite chocolate from all times. Yes! I love when I'm home alone with a bottle of wine and a handful of episodes of Grey's Anatomy or Girls. 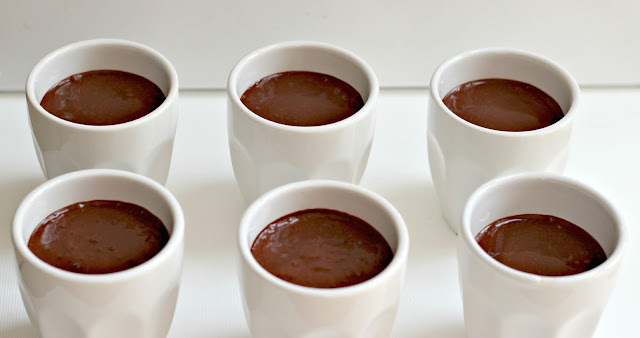 These chocolate pots look like the perfect thing to go along with that kind of night. How do you think they would be without the egg? I'm super squeamish about raw eggs. The hot milk cooks the eggs. Oh yes, Gabrielle, I forgot the LOUD music... and MY music too. Not music that has to be approved by the unofficial music experts of the household. Hey Katie. Thanks for your comment. These pots are just the thing for a precious and indulgent night in on your own. Be sure to have your remotes within arms reach, make a marshmallow-land with pillows and cushions on the sofa, get all comfy, then dive in to your pillows and your pot of chocolate (or two). Heaven. I wouldn't make these without the egg, they probably won't set to that unctuous, silky texture without it. AND Anonymous (below you, yes, right there), is bang on the money. The hot milk and cream cooks the egg. No raw egg nightmares for you. Magic. Btw: How do you make your vanilla?? It too looks heavenly! This recipe assumes you're using a food processor. It does get mixed in. If you don't have a good processor (like me), I would guess a hand mixer or stand mixer would work. That's how I plan to try this recipe. *food processor. Pardon my phone keyboard and my lack of attention span. Get a sterilized glass jar with a lid, some high-proof alcohol like vodka, bourbon or rum - 80 proof (the hard stuff). 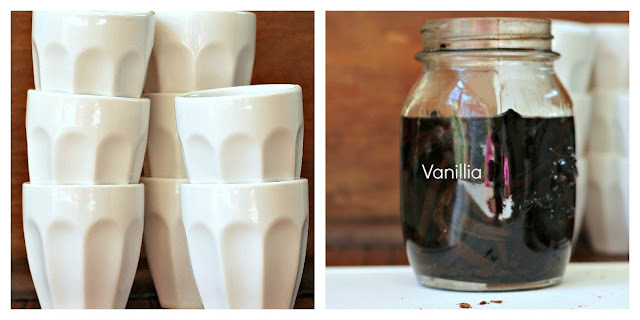 Use three vanilla beans per cup of alcohol. Cut the vanilla beans in half lengthwise. Put the booze in the jar, put the beans in the booze (make sure they are completely covered) and store the jar in a dark place for two months. You'll have amazing vanilla extract for ever. Just keep topping up the alcohol and whenever you use a vanilla bean and told to discard it, add it to the jar. I think I have about 50 of those suckers in that jar you see. Hey Anonymous. This recipe is made with a food processor with a blade attachment. I've never made it without a food processor. The recipe is pretty much perfect, so I haven't tinkered with it. 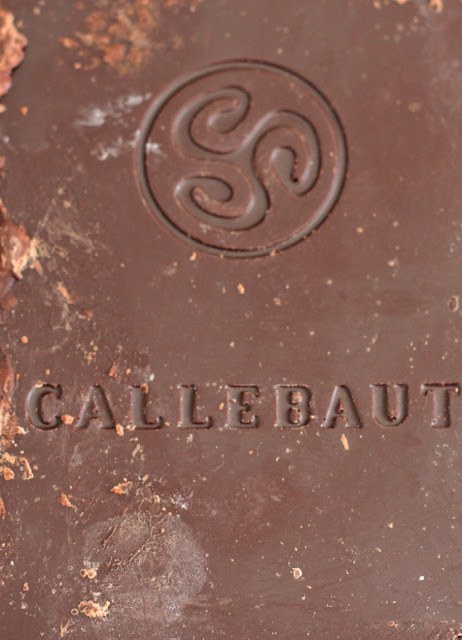 If you want to make this by hand, I suggest the crucial part is to shave or grate the chocolate super-fine. That way it will melt quickly. Good luck. My name is Vera Zecevic and I'm owner of cupcake recipes & ideas blog http://www.cupcakesgarden.com/. I spotted on your blog couple of days before searching for a great cupcake recipes. You have really amazing blog. I adore all of your cupcake and dessert recipes. I think that you have great writing style and your images are beautiful! Everything is just perfect. The reason I'm writing this is I’ve just lunched new page on my blog called "Cupcake Artist’s Recipes” where I want to promote some great original cupcake recipes from authors which make great cupcakes (I think you are the one of them)! I’ve had two cupcakes guests with wonderful recipes! The last one http://www.cupcakesgarden.com/rainbow-buttermilk-lemon-cupcakes-with-rainbow-cream-cheese-frosting-by-food-is-my-life/ was real hit on Pinterest ! We had tons of likes and repins! I have great Pinterest community now, and I've found out it is a great network to promote recipes. I would really like you to be a part of my new page! If you are interested in guest posting I would really like to publish some of your great cupcakes on my blog. You can check any of Cupcake Artist's Recipes for example. As a reward I will put your banner ad (125x125px) for two month period, on my home page (right sidebar) and you can write your bio with backlink on your guest post. Unfortunately, I can't still offer you money, we are still growing blog. We have approximately 1000 daily unique visitors (dessert lovers) with everyday growing tendency. Also I have big Pinterest community (12000 followers) who like to share great recipes, so I can promote your recipes on Pinterest also! So, I would really like you to be part of my new page! If you are interested for my offer be free to contact me! Hi Vera. Thank you for contacting me. I will contact you via email. So delicious and made with ingrdients tat I usually have on hand. By the way, where did you get the cups from? Lovely! where did you get those cups?? super cute! What? Now hot water bath?! This is going to be my new go-to! *That should be "no hot water bath". I missed the typo until I posted. 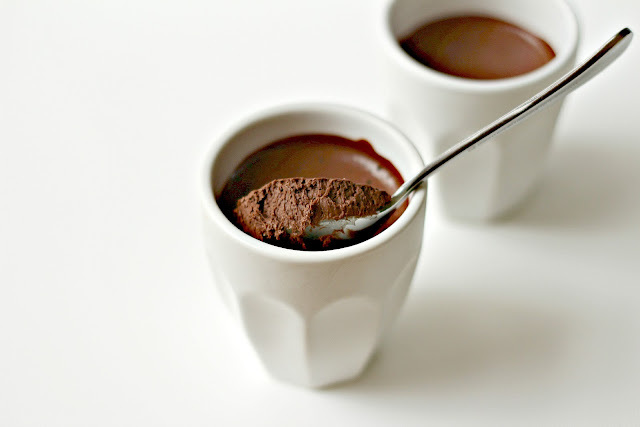 I love Chocolate pots. This recipe is much faster than my favourite Nigel Slater White Chocolate pot au creme. Thanks for sharing this and love the photographs. I've made this twice already- so good! Thank you!! BTW Glittergirl and F, I got these little pots from a local department store called Spotlight a few years ago - they are exactly the right size, but any small coffee/espresso cup would do. Thanks for your lovely comment Very Highbrow - you can google measurement converters - it would be so much easier if we all used the same system wouldn't it? Thank you Sharmila. This is such a simple recipe with amazing results. Thanks so much for your comments. Oh Annie, twice already?... You're a girl after my own heart!